McEnroe, Courier, Navratilova, Austin highlight 2012 CTCA Tennis Championships in Surprise! CTCA - MIXED DOUBLES SHOOTOUT on SAT OCT 6 - Play to Meet the Players! SURPRISE, AZ - John McEnroe; 17 Grand Slam titles, will join Jim Courier; 4 Grand Slam Championships, Michael Chang; 1 Grand Slam title and Todd Martin; 13 career titles, at the 5th Annual Cancer Treatment Centers of America Tennis Championships October 12-13 at the Surprise Recreation Campus – Tennis and Racquet Complex. Surprise is the first of 12 stops on the National PowerShares Series; a competitive tennis circuit for tennis champions over the age of 30. The tournament will showcase four men’s players paired off in two 1-set semifinals followed by a 1-set championship match. The champions will compete for a prize pool totaling $1 million to be shared by the top three finishers at the conclusion of the season. 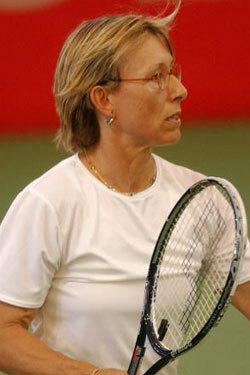 The 5th annual CTCA tournament also features an exclusive Mixed Doubles match with Martina Navratilova (pictured below); 59 Grand Slam championships, Tracy Austin; 3 Grand Slam titles, John McEnroe and Jim Courier Friday, October 12 preceded by a singles match featuring Courier and McEnroe. Individual tickets and 2-Day Packages will go on sale early August. VIP packages and Corporate Sponsorship packages are available now. SPECIAL OPPORTUNITY: As a USTA Southwest Member each ticket purchased by August 31st enters you into a special USTAdrawing where you will have the opportunity to win one of many VIP packages including a spot in one of the Players Clinics, an exclusive VIP Meet and Greet opportunity or a ticket to a VIP Cocktail Party with the Players. Don't forget to use promo code USTA12 when you purchase! Call the Surprise Recreation Campus Box Office at (623) 222-2222 to be added to our priority list. This is a combo mixed doubles tourney (for NTRP 6.0, 7.0, 8.0 and 9.0). It is limited to 16 teams per division. Included in your $75 entry fee is a ticket to the Friday, Oct. 12 evening session, passes to meet players at the exclusive Players QnA that night, and food and drinks. For your entry fee - you will also get a group photo with the players. Division winners can go one step further, getting passes to the CTCA VIP Meet and Greet and will also be recognized on Center Court between matches! Learn more about the Shootout HERE. Check out www.surpriseaz.gov/tennis for more information.